A rare expression of Tomatin's Cu Bocan range of peated single malts. This was distilled in 1989 and apparently came about due to an unintentional production error. Now the distillery makes some very limited amounts of peated single malt for just a few weeks every year. 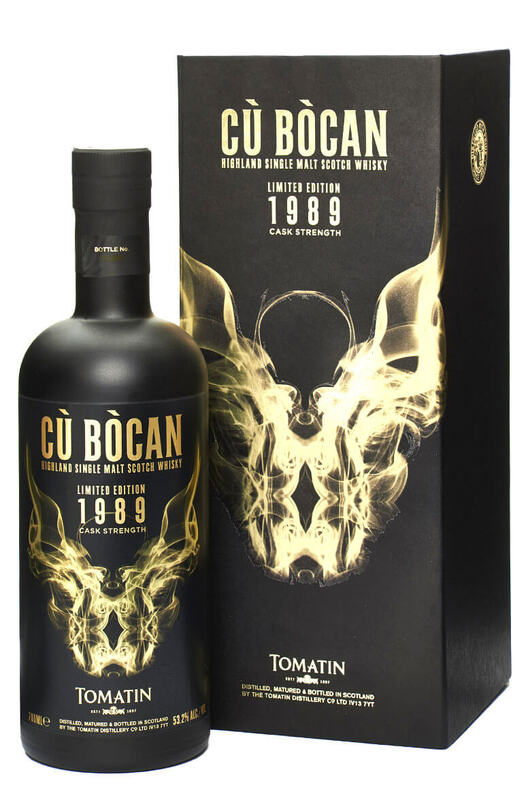 Cu Bocan 1989 was drawn from just three ex-Bourbon barrels and the yield was 1080 bottles. Aromas (without water) The initial smoke is light, like distant burning kindling and has a heathery character which quickly gives way for fresh fruits – pear accompanied by citric lime zest and sweet pineapple. After time in the glass it becomes much sweeter with honey, vanilla, coconut and custard. Herbaceous notes of basil and rocket. Palate (without water) The smoke and the floral heather notes are more prominent on the palate. Sweet abundance of fresh fruits; orange and grapefruit followed by blackberry and blueberry. Some ginger and clove spice is also hidden in the background. Finish: Very smooth with a long lasting earthy, yet sweet smoke. Types of Barrel used for Aging Aged in three ex-Bourbon barrels. This is a lightly peated whisky from the Tomatin Distillery in the Highlands. Cu Bocan is named afte..
A limited edition of just 6000 bottles. This bottling has been exclusively matured in ex-Bourbon bar..